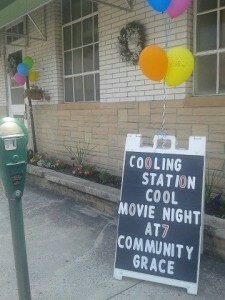 The Greencastle, Pa., Grace Brethren Church has opened it’s doors for people without air conditioning. With temperatures in the Midwest and East reaching close to 100 degrees this week (along with little or no rain), communities have begun issuing “no burn” warnings, have called for a moratorium on watering lawns, and have begun to provide places for people who don’t have air conditioning to stay. In Greencastle, Pa., the folks at the Grace Brethren Church (Paul Hutchison, pastor) see this as an opportunity to reach people in their community. This afternoon on Facebook, Denise Hutchison, wife of the pastor, announced that the church would be open as a cooling station. …the cooling station is in conjuction with Emergency Services in Franklin County. With the rennovation that God has allowed here, we have plenty of space, that is air conditoned rooms to house folks during heat waves like we have on the East Coast. Last year when temps reached 115, we opened the doors and made a few phonee calls and God blew it wide open! WHAG TV, newspapers, radio stations all got in on the good thing. Last year there were three families and three homeless teens who took the offer. At the Greencastle, Pa., Grace Brethren Church, cots from the Red Cross await people seeking respite from the heat. 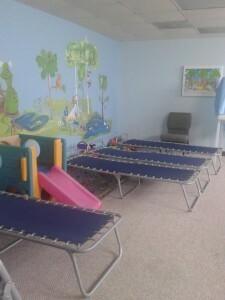 This year we just opened this afternoon, the cots and water just arrived from Emergency Services. The Salvation Army will provide meals. God has brought all of this together to glorify Himself and He does a good job at that. The impact, wow, where do I begin… we are now known as the caring church, our Here to Help is active in helping the needy with food, clothing and necessities… our church family has grown stronger in faith and desiring to do the work for the Kingdom. We are hosting a movie night for the community tonight at 7.. Emergency Services sends out a bullet email to all community organiations in the tri-state area, all newspapers, all tv stations and all radio stations.. are now hearing that Community Grace in Greencastle, Pa. is open as a cooling station. God is so good!